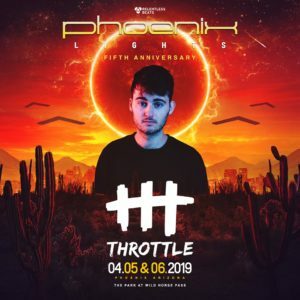 Hailing from the land down under, 22-year-old Throttle will be trading green Melbourne suburbia for the desert city of Phoenix when he makes his debut performance at Phoenix Lights Festival in early April. Growing up in Australia, Throttle, aka Robbie Bergin, took to music at an early age. Learning guitar as a child and listening to independent labels like Triple J, Bergin quickly stepped up to the DJ table. Initially creating mashups for friends at house parties, his love for production continued to blossom. By blending elements of progressive House, Hardstyle and old school Disco, young Bergin began to combine these styles into a new genre he calls Dirty Disco. We had a chance to catch up with Robbie before his set at Phoenix Lights to discuss his inspirations, influences and meteoric rise as one of EDM’s freshest sounds. CYM: You’re already making a name for yourself in the electronic world in your early twenties. How old were you when you first started getting involved with music? Throttle: Started playing guitar at age 8. I started DJing when I was 13 and started producing at 14. When I first started DJing I was just making mashups using a Hip-Hop acapella over a dance beat. I was then introduced to a friend who was making these dance beats that I was using, and it was mind blowing to me at the time. It then made me start to wonder how I could start making my own beats. CYM: Is there a certain influence you can point to that inspired you to move toward EDM and producing? Was there a trigger that made you decide to start producing your own music? Throttle: Madeon was a huge influence for me early on. He was wiping out everyone in the scene at just 16 and his music just took off. He really inspired me to start making music out of my bedroom because at that point I had no idea on how to invent music and the process was quite overwhelming being a kid at home. All these things came together when I was 13/14 and led me to start making my own music. CYM: I’ve noticed that sometimes one of a DJ’s first shows are the most memorable ones for one reason or another. When did you first start playing live DJ sets? Do you have a notable experience from that time? 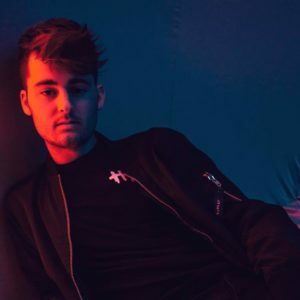 Throttle: I first started playing house parties which gave me a really diverse interest in music because you have to have all sorts of different music to play these parties. The first house party I ever played I had to beg my friend to let me DJ their party because it was on the same night as my school awards night. There was only about two-thousand dollars worth of gear. It it started to rain and all the gear got wet. The cops came and told us to turn the music down because it was too loud. It was the perfect first gig. CYM: From playing local house parties to travelling internationally to play your music. You will be playing in Arizona for the upcoming festival. Have you visited Phoenix before? Throttle: I first visited Arizona as a kid on a family vacation with my parents in 2004. Since then I’ve played Phoenix twice. I love it there. CYM: The music scene in the region has really been taking off lately. Phoenix Lights is considered one of the biggest electronic events in that area as well. What are you most looking forward to while playing Phoenix Lights? Thottle: I’ve been keeping tabs on Phoenix shows to be honest. I’m excited to get back and see the crowds there. I’ve never played a festival in the Southwest. There are also a lot of artists on the lineup that I really love. CYM: One last thing while we are on the topic of Phoenix Lights. Considering this will be your first time playing a festival in the state, can you give us some insight on what can we expect from your set at Phoenix Lights? Throttle: A lot of new music. I have so much music I have been working on recently. I had a couple months off before this current run of U.S. shows and I have an E.P. almost finished. I have a bunch of new stuff I am going to play. CYM: Playing almost a half world away from where you originally started playing music and attending shows must feel a bit different. How do festivals in United States differ from ones in Australia? Throttle: America is more open to dance music. The artist choices and the music that is played is all different. While in Australia it’s more underground and indie. There’s a lot more diversity in music tastes in the U.S. The American festival is certainly more grand whether it’s the stage design, with the way people dress up and the props they bring. I’ve never gotten Kandi at an Australian show that’s for sure. CYM: Let’s dive into Dirty Disco a bit. The first time we came across Dirty Disco was on your soundcloud mixes. Is this something that you created? Explain what Dirty Disco is and where it comes from? Throttle: It started as a radio show as you mentioned. It was an attempt to sum up my music which has always been inspired by Disco, whether it’s the groove or soundscapes I use, but doing it in a modern way. Hence the Dirty part. Taking influence from Madeon and Daft Punk by looking at the sampling and the combination of elements from different eras. Dirty Disco went from my radio show to the way I like my music to throwing a Dirty Disco party in Miami. It’s become much more than I originally anticipated when my 14-year-old self first came up with the name. CYM: Recently, I came across a photo of you standing on top of a DJ booth playing a guitar. That is pretty epic but is that something you usually play guitar at your live shows? Throttle: It isn’t something I have done too much over the past year but definitely something I am going to bring back. Once the new music comes out, I think it will make a lot more sense because it’s a bit more musical I’d say. Right now, I am sorting out the gear and will bring that live element back at the right time. CYM: Can you speak a bit to where you find inspiration? I am sure travelling internationally is not easy on the creative process. Throttle: By living. That is the only way. I think a lot of people lose inspiration when they go on the road or start making music because they shut that part of their life off. Just enjoy life, go out to concerts, eat good food and meet new people. Inspiration comes from everywhere and strikes at the weirdest times for me. CYM: That is some very good advice. Inspiration usually leads to motivation and accomplishment. What would you consider your biggest musical accomplishment to date? Throttle: Probably doing the official Remix of September by Earth, Wind and Fire. It’s one of my favorite songs of all time and I was allowed to use the original stems from the band. To have that permission and Thank You from the band was amazing. CYM: It looks as if Phoenix Lights is the last stop on your Spring Tour. What’s next for Throttle? Throttle: Doing a lot of festivals in Europe. I’ll be back in the U.S. for a little while over the summer. As I mentioned there is a bunch of new music on the way. A lot of stuff I am really proud of and have actually song written myself. A lot of excitement. 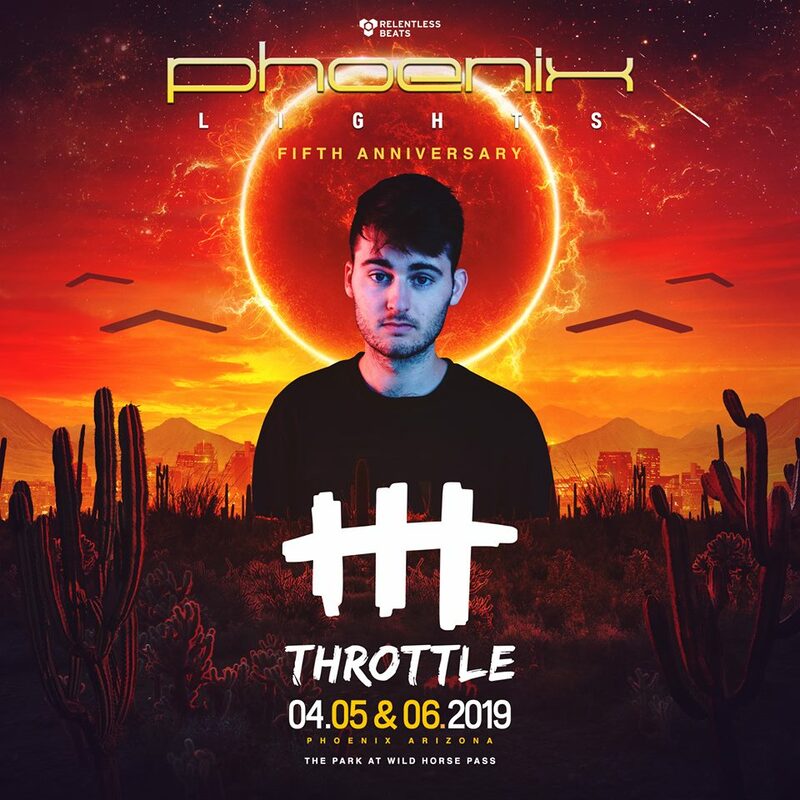 Catch the slice of the Dirty Disco action on Saturday as Throttle takes part in the Phoenix Lights takeover on the Invasion Stage. Tickets are still on sale via the PHXL2019 website.